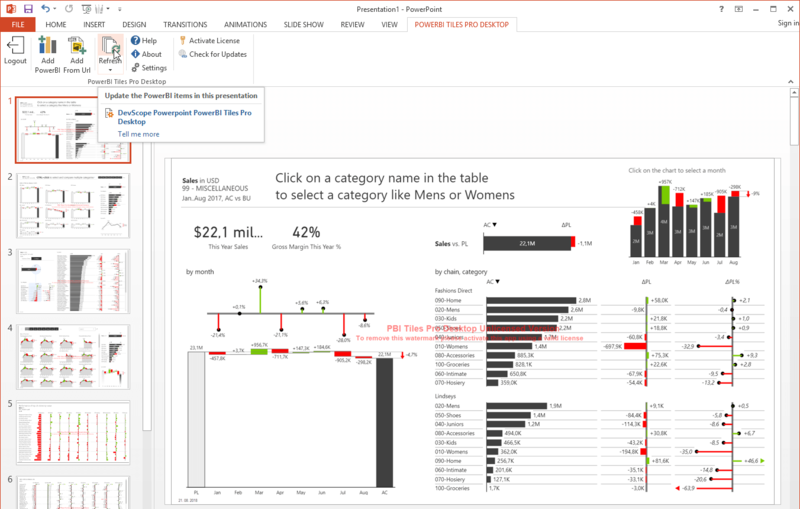 Power BI allows exporting your report pages to MS PowerPoint, as described here. R visuals and ArcGIS visuals are not supported. A full list of limitations is provided by Microsoft here. Especially the fact that PowerPoint slides cannot be refreshed and that you cannot create a PowerPoint slide deck from selected report pages from several different reports makes the Export to PowerPoint feature unfit for typical business use cases. Power BI Tiles PRO is free for Office online and a paid tool (with a tree trial) for Desktop.